Jungle Red Writers: What are you reading? ROBERTA: Okay Reds, time to stock up our summer reading stacks with your recommendations! I met a lot of interesting writers last year in Key West, one of them named Rosalind Brackenbury. I've had her book BECOMING GEORGE SAND on my pile for a while--I was afraid it would be a little slow. But it turned out to be quite lovely--the story of a professor in Scotland who becomes obsessed with George Sand, and studies Sand's life and work to find answers for herself. I've also been reading lots of food-related books, including a memoir by Sandra Bullock's sister, Gesine Bullock-Prado. Gesine worked in Hollywood for a while managing her sister's movie production company. But she hated it and decided to leave the familiar and open a bakery in northern Vermont. What an interesting story! And I've got some good options burning my TBR pile, including new books by Steve Hamilton (love his series set in the UP of Michigan) and Megan Abbott (highly recommended by Hallie), and a couple of Barbara O'Neal's backlist books that somehow slipped my attention. Oh, and I've downloaded our own Deborah Crombie's first novel onto John's Kindle--she's the only Red I've had yet to read. Must correct that right away! And The Immortal Life of Henrietta Lacks, by Rebecca Skloot. The last two books I'd highly recommend to anyone. The first two are for subject-specific readers..
HALLIE: Making a list and adding on... Kindle is so great at giving you access to all kinds of books that you'd have to hunt and hunt for. I'm promising myself a Kindle... or a Nook... or an iPad... how to pick is a blog for another time. If there was just one choice I'd have it by now. 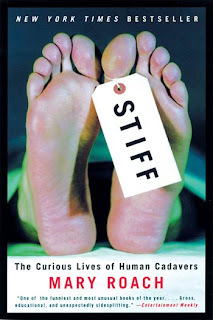 I loved Mary Roache's nonfiction STIFF -- all about what happens to dead bodies. She's a hilariously funny writer and fearless researcher. It opens with: "The way I see it, being dead is not terribly far off from being on a cruise ship. Most of your time is spent lying on your back. The brain has shut down. The flesh begins to soften. Nothing much new happens, and nothing is expected of you." In my TBR pile, Joseph Finder's BURIED SECRETS and Gary Braver's TUNNEL VISION and Margaret McLean's UNDER FIRE. Also all the Harry Potter books to reread. ROSEMARY: I also enjoyed STIFF. On August 17th I'll be moderating a talk with Edward Conlon and Andrew Gross and I was just sent their latest books. I happened to open the package from Random House first and I haven't been able to put down RED ON RED by Conlon. I even took it in the cab with me on the way to the theatre last night (WAR HORSE, great, by the way. 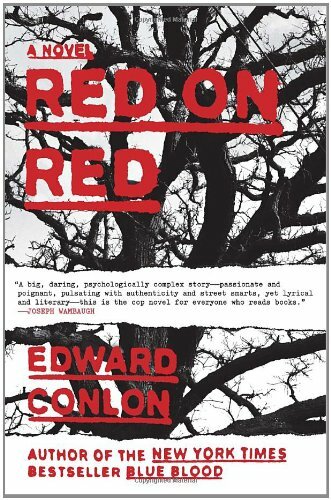 )Conlon is a NYPD detective and is the author of BLUE BLOOD, a memoir and NY Times bestseller from a few years back which I didn't read, but will now. It does RED ON RED a disservice to call it a police procedural although it is ostensibly the story of two cops. Halfway through.. it is the story of two men, their lives, their friendship, their passions, flirtations, memories. It is exquisitely written communicating their lives, the place, the circumstances and the job without the endless cursing and "hopping in and out of the Crown Vic" that bores me to tears in many police procedurals. Not to sound like such a delicate flower - there is profanity - but it's there when it needs to be there, not because the writer wants you to think the book is dark, edgy, or hard-boiled or is too lazy to fully flesh out a character. Anyway...can you tell that I'm lovin' this book? RHYS: I'm a judge for an Edgars committee this year so that is my first reading priority at the moment, but waiting on my Kindle for when I escape to Hawaii next month are Kate Morton's Rivington Street, Jan Burke's Deliverance and Connie Willis's Blackout. I don't know about you but I can't read fiction when I'm writing so my bedtime book is currently Bill Bryson's Notes from a Small Country--a journey around Britain which I'm enjoying a lot. HANK: Yup, Edgar Judge. More I cannot say. DO YOU REALIZE HOW MANY MYSTERIES WILL COME OUT THIS YEAR??? Just saying. But I am having a terrific time. JULIA: Every July, I appear at the Boothbay Book Festival, sponsored by the Maine Writers and Publishers Alliance. I always walk away with a stack of summer reading, and this year is no exception. I picked up SHOW ME GOOD LAND by Shonna Millikin Humphrey, which can best be described as The Beans of Egypt Maine solve a murder. I got Jim Nichols' HULL CREEK, about a lobsterman tempted into pot running in order to save his family's home from voracious out-of-state developers. This is actually turning out to be a lot funnier than I expected! 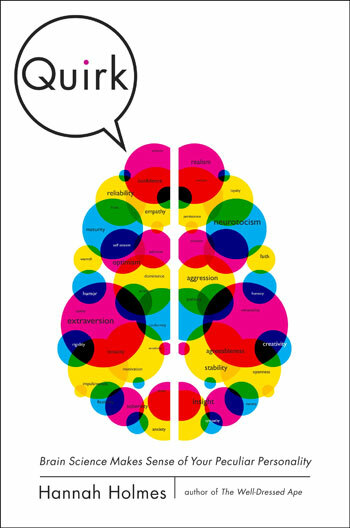 And I was happy to buy my friend Hannah Holmes' latest, QUIRK: BRAIN SCIENCE MAKES SENSE OF YOUR PECULIAR PERSONALITY. Some of you may know Hannah from her first book, THE SECRET LIFE OF DUST, I think she's the funniest, most intelligible science writer out there. I've just read some great mysteries: Amanda Flower's MURDER IN A BASKET, Sarah Graves' DEAD LEVEL, C.C. Benison's TWELVE DRUMMERS DRUMMING. Unfortunately, as I'm sure is the case with the rest of you ladies, I can't push them on anyone because they won't be published until next year! DEBS: Yep, Edgar judge, too. Looks like JRs got blitzed this year. But I've been reading mostly mysteries just for fun as well. Julia, I liked TWELVE DRUMMERS DRUMMING, too. A couple of weeks ago I read A DISCOVERY OF WITCHES by Deborah Harkness, which is my "find" of the last several years. LOVE that book! Will read it again! And can't wait for the next in the trilogy. Now I'm reading a lovely novel called IN SEARCH OF THE ROSE NOTES by Emily Arsenault. Next up is COME AND FIND ME by our own Hallie Ephron, and I can't wait for that! And THEN--drum roll--my much anticipated summer highlight--GHOST STORY by Jim Butcher. It will arrive on my doorstep on the 26th and I know I'll be hard-pressed to get any work done that week . . . This has made me realize I'm not reading much non-fiction this summer, but I was steeped in research all spring, and besides, that's what summers are for, right? Thnaks Reds for adding to my t-b-r list. I too love Mary Roach and have read all of her books! In my book bag are two novels I've been saving up: Crooked Letter, Crooked Letter by Tom Franklin and The Scent of Rain and Lightning by Nancy Pickard. When I finish with those I'll head on over to Blue Hill Books and perhaps pick up something one of you has recommended. My daughter brought home an ARC of Gesine Bullock-Prado's book, and I really enjoyed it. I just finished Vincent O'Neil's book Death Troupe. He'd been telling me about it for years at conferences and I finally grabbed a copy from his hands at Malice Domestic. It does not disappoint--I really wasn't sure how it would end until, well, the end. Brenda - lucky you! Those were two of my favorite books from last year. Brenda,totally--you couldn't have picked two better! I finished Steve Hamilton's MISERY BAY last night. I adore his character Alex McNight, and you shiver all the way through with his descriptions of the cold in the northern reaches of Michigan. (Not so bad in a heat wave!) And the action is nonstop. Going on vacation to Oregon with me: SHELTER by Jayne Anne Phillips; A PLACE OF EXECUTION by Val McDermid; KINDNESS GOES UNPUNISHED by Craig Johnson (a book from mid-way through his Walt Longmire series that I missed somehow); and A LETTER OF MARY by Laurie R. King (also an early book in her series that I missed). Can't wait! Brenda--loved both those books you're about to start. JR--Thanks for the great suggestions. I just realized that I have the title of Jan Burke's new book wrong yet again. Why can it have stuck in my mind so crazily? It really is DISTURBANCE, and I keep thinking of it as Deliverance. Maybe because I know it will probably be scary.